In May and June 2012 Wessex Archaeology undertook excavation and recording of an 18th century garden feature, a former water cascade within the grounds of Bramham Park, Wetherby, West Yorkshire. The Grade 1 listed grounds and park at Bramham were laid out during the period 1700–1713 for the Benson family, and include early water garden features which have not often survived in contemporary gardens. Repair and restoration of the features is underway and the recent excavation work focused on a former cascade feeding water from a reservoir pond to a parterre garden, cut into a terrace to the immediate rear of Bramham House. A plan of Bramham Park by John Wood the Elder in 1728 indicates that water in this cascade "falls 21 feet on thirty steps". However the cascade appears to have only operated as a temporary feature and fell out of use at a fairly early date due to an inadequate water supply. Attempts were made to try and improve the water flow, including the removal of almost all the steps and their replacement with a stone-capped culvert. However, this too seems to have failed and the culvert and cascade were covered over by the end of the 18th century. 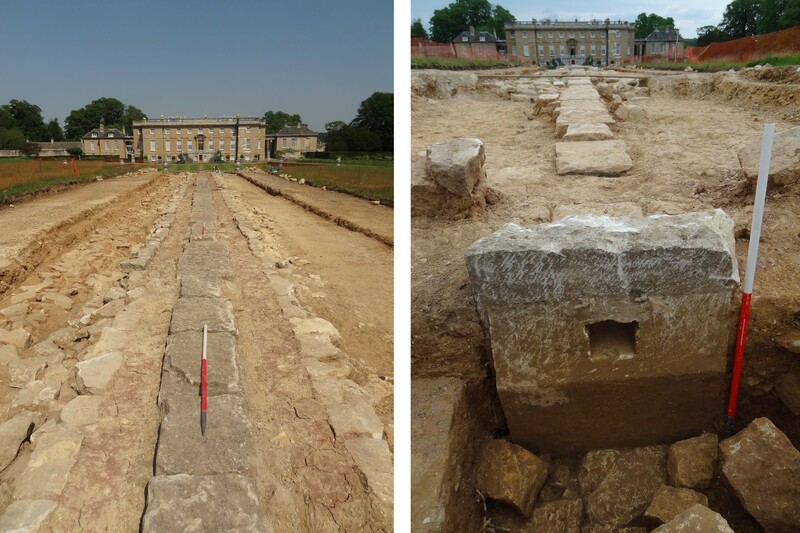 The results of the excavation, including laser scanning of the excavated cascade and extant fountain, are now being used by the project team at Bramham to inform restoration proposals. A watching brief on the restoration of the Rocky Cascade is on-going.